Our most common jobs are based on Volume Pricing, the volume of space that the junk will take up in our truck. Our truck has a hauling capacity of 15 cubic yards (405 cubic feet), or a box measurement of 9′ long x 7.5′ wide x 6′ high. That is equivalent to 18 queen size mattresses! This price is all inclusive and takes into account the labor, transportation to and from the site, disposal fees, and taxes. Some materials have a surcharge fee and are listed below. Electronics must be recycled in the state of Pennsylvania by a certified e-waste recycler. The following fees are based upon the rates that our company is charged to dispose of each of these items. We understand that these fees are burdensome, but we have not been able to find a cheaper alternative for legal disposal. Televisions……………. Tube TVs up to 27″ are $45 each. Tube TVs over 27″ are $90 each. Flat Screen TVs up to 42″ are $55 each and over 42″ are $80 each. Projection Style TVs are $200 each. Concrete, Shingles, or Topsoil can only be accepted in a maximum one yard load due to weight restrictions and prices vary. 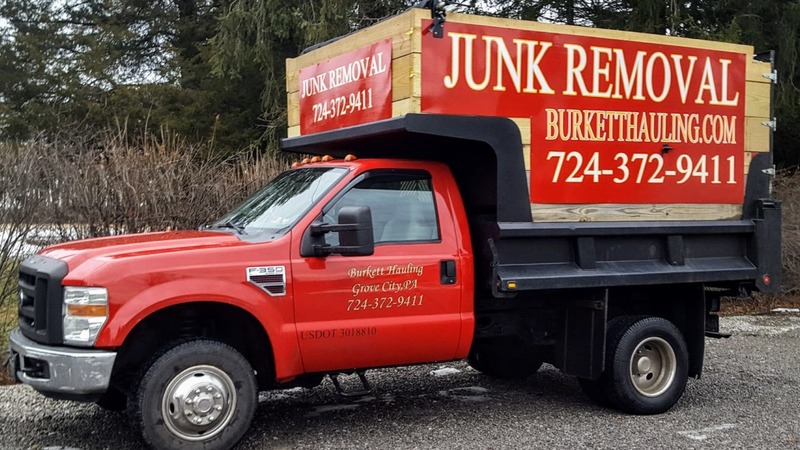 Demolition fees vary for shed removal, Jacuzzi or spa removal, and etc..
Cash, Credit, and Checks are all accepted.